THE WESTMINSTER CHOIR is for adults who enjoy choral singing. Rehearsals are Thursday evenings at 7:30 p.m. 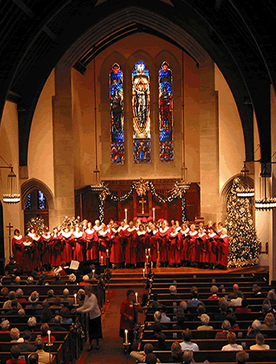 The choir sings at the 10:00 a.m. service from September through May, occasionally in the summer, and in seasonal concerts. Along with the music, the group enjoys great fellowship; the season begins with a fall choir retreat and dinner and ends with a springtime brunch. There are no auditions. Please contact Dale Rogers or speak to one of the choir members if you are interested in participating. THE WALNUTS is a quartet of Westminster members which performs a wide variety of 4-part harmony music coached and accompanied by music director, Dale Rogers.